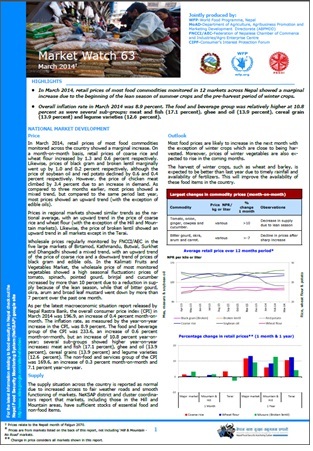 In March 2014, retail prices of most food commodities monitored in 12 markets across Nepal showed a marginal increase due to the beginning of the lean season of summer crops and the pre-harvest period of winter crops. Overall inflation rate in March 2014 was 8.9 percent. The food and beverage group was relatively higher at 10.8 percent as were several sub-groups: meat and fish (17.1 percent), ghee and oil (13.9 percent), cereal grain (13.9 percent) and legume varieties (12.6 percent).